The Young and the Restless (Y&R) spoilers tease that Hilary (Mishael Morgan) will play dirty. She’ll feel like she has to fight for what she wants. Hilary will choose blackmail as her next strategy. There’s no confirmation who Hilary might threaten, but Mariah (Camryn Grimes) could be a great option. After all, the feud between Hilary and Mariah is stronger than ever. Hilary pushes Mariah’s buttons every chance she gets. Even through Mariah and Devon (Bryton James) aren’t together anymore, their friendship must get on Hilary’s last nerve. Plus, Hilary hasn’t been getting her way at Hamilton-Winters. Devon still has a soft spot for Mariah as a pal, so Hilary might think her cohost could be useful. She realizes Mariah has plenty of influence with Tessa (Cait Fairbanks), too. Hilary may believe Mariah can rope Tessa into her plan. She might want them to help her out with wearing Devon down. Y&R fans know Hilary’s always trying to score more power. She wants an office, a parking spot and total control of her show. Hilary’s got several other projects she’d like to work on for Hamilton-Winters, so she needs the team to get on board. The Young and the Restless spoilers say Hilary will do whatever it takes to accomplish her goals. Perhaps Hilary will tell Mariah to shut up and get with the program. She could urge Mariah to play by her rules unless she wants her secret to come out publicly. Hilary’s a super snooper, so it’s possible she already put all the clues together. It doesn’t take a genius to figure out those lyrics were about Tessa. Hilary could threaten to turn this into a media spectacle. 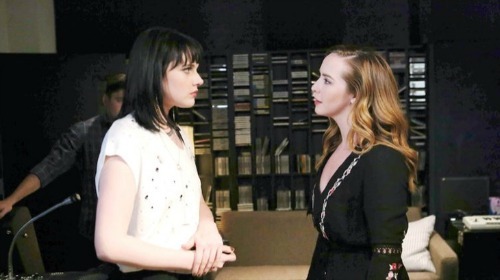 In Tuesday’s Y&R episode, February 6, Tessa goes on and on about how likable Mariah is. She thinks that’s why viewers connect with her. That obviously won’t sit well with Hilary. She may be out to destroy Mariah’s career if she can’t get some cooperation. Hilary could easily spill the whole ugly story of Mariah making out with her brother’s girlfriend. Noah (Robert Adamson) will be in more pain than ever if a cheating scandal erupts. Nevertheless, Tessa might take a stand if it comes to this. She could just tell Hilary to shove it and encourage Mariah to let her blab. This secret’s been pretty contained so far, but will it stay that way? Will Hilary be the one to spread the word? Could it spark a real relationship for Mariah and Tessa? We’ll give you updates as other Young and the Restless news comes in. Stick with the CBS soap and don’t forget to check CDL often for the latest Young and the Restless spoilers, updates and news.